DJI is the choice brand for anyone wanting a serious drone. Regardless of your budget or what size of drone you need, the company more than likely has something that will fit your needs. With the Mavic 2 Pro - and its built-in Hasselblad camera (the camera maker was acquired by DJI) - the Chinese companty clearly saw a gap in-between its popular Mavic Pro range and the larger, less portable Phantom 4 Pro Obsidian. That's what the Mavic 2 Pro represents: a portable, foldable drone that's really powerful and takes great pictures. Looking at it, the Mavic 2 Pro is essentially a slightly bigger version of the Mavic Pro. The newer model is a few centimetres wider, longer and thicker than the Mavic Pro Platinum and it weighs over 160 grams more. But that's more-or-less it: folded, it's drone is not much bigger than a big sports drink bottle, which is great for portability. 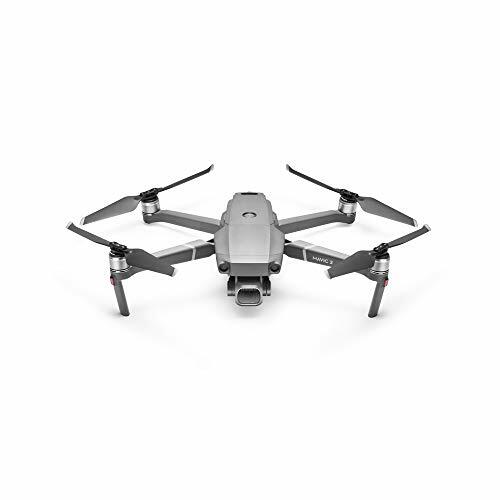 However, while the Pro 2 has a similar angular look and overall silhouette to the Mavic Pro, there are few indications that this is a very different drone. Firstly, there's the large square camera housing attached to the gimbal on the front, upon which the Hasselblad name is proudly placed. Secondly, look around all the sides and you'll notice quite a few more sensors. This is key to the experience of flying the drone. Rather than just have forward-facing obstacle avoidance, the Mavic 2 can detect obstacles from every side (including on top, where you shouldn't need it too often). The battery takes up most of the rear half of the drone. It's released by sliding a catch on either side, then just clicks into place once you've charged it. You'll also find the power button here, with an LED indicator ring surrounding it to show you how much battery capacity remains. Unlike the more 'sporty' Mavic Air, the Mavic 2 is only available in a rather serious grey colour scheme. The front arms come with the trademark Mavic stands to hold the camera off the ground, while the rear arms have more subtle grippy feet. While a lot of this will be familiar to anyone who's used or seen a Mavic drone before, because it's a sign of how well made these drones already are. This drone doesn't feel lightweight or flimsy, which is reassuring for a number of reasons: you know it won't just break in your bag; and you know the wind won't blow it away like a discarded helium balloon from a child's birthday party. Part of what has made DJI's drones so successful is that they automatically take care of the basics for you. Tracking location, fighting against the wind and avoiding obstacles. With the Mavic 2 Pro, you get all those features at the highest levels available in a consumer drone. Not only do you get obstacle avoidance from every side, stopping you from crashing the drone, but you also get the APAS system - which can be enabled to ensure that as you're flying between obstacles the drone doesn't just stop moving, but adjusts its path to bypass those elements that might otherwise get in the way. Without the APAS system, it does what every other obstacle avoiding drone does: it bleeps and tells you via the remote screen that it's near an obstacle, then stops moving towards it. With that, and the warning when wind gets a little too blustery, there's plenty built-in here to ensure you don't end up trashing you expensive flying machine. As for that remote, it's virtually the same as the one that came with the Mavic Air, meaning you get joysticks that screw on and off, which can be stowed conveniently in their own dedicated silos, hidden by the phone grips. You also get a selection of cables for connecting to whatever smartphone you happen to own. There's Lighting for iPhones and USB Type-C/Micro-USB for Android phones of various ages. We'd prefer to have a remote with a built-in screen, but we appreciate the space saved by having a compact, collapsible controller like this. Like the drone, it'll easily fit inside a bag, and will happily squeeze into a side pocket internal bag compartment. What's more, since you have a smartphone, you already have the drone monitor you need right in your pocket. Using the remote and phone app, with the basic automatic settings used, it's pretty simple to fly the Mavic 2 Pro too. Just hit the take-off button after GPS location is tagged, then the drone takes-off and hovers above the ground. The two joysticks do what they usually do: one controls altitude/height and the direction the drone points; the other controls the direction in which the drone flies. What makes DJI's drones great is the slew of automated flight modes that take advantage of the advanced object tracking and motion sensors to produce some truly spectacular cinematic shots. The aptly named Cinematic mode smooths out movement, acceleration and changes of direction to ensure you capture super-smooth footage. Combined with the highly effective mechanical gimbal to which the camera is attached, you get heavenly shake-free footage. Similarly, the other modes - like the various QuickShot options - give you stable and often breath-taking footage. Most of these options are available on the smaller Mavic Air too. New is Dronie, which acts like a crane, starting close-up and then moving backwards, up and away while keeping a lock on the subject (it can automatically detect people within a frame, so you don't necessarily need to tap on the display to select anyone). Other modes include the Orbit mode that circles around the subject in an elliptical path, changing height and velocity as it's going around. You also get Asteroid that shoots straight up in the air and holds its position while snapping photos of the entire surrounding scene to create a 360-degree tiny planet-style image. It didn't seem to matter which shooting mode we choose, or what functions we asked it to perform, the drone did so flawlessly. There was no shakiness in the video, even when winds got quite blustery, and none of the QuickShot modes failed to record properly. We haven't had an experience this consistently good since we flew the much bigger Phantom 4 Pro Obsidian edition. Then there's the Mavic 2 Pro's 31 minute battery claim which is generous by our count. We couldn't ever get it to last 31 minutes on the North Wales coast, even when the breeze was relatively still. While recording 4K video capture, and testing the various preset flight paths, among other features, we got around 20-25 minutes on a full battery before it would warn us it was getting low. Still, for a drone, that's actually pretty good - but we'd recommend getting a second battery as backup nevertheless. The one thing that sets the Mavic 2 Pro apart from its predecessors is the lens and sensor on the front. This drone has a large 1-inch, 20-megapixel sensor encased in aluminium, and the optics are built in collaboration with Hasselblad. Even if you have everything stuck in automatic shooting mode, both stills and video look great as a result. With HDR (high dynamic range) mode switched on, resulting photos are detailed, colourful and have plenty of contrast - which is great for those who perhaps haven't yet built up experience playing with manual controls, or those not too comfortable in a photo editing suite. Despite that, there's plenty of manual control here, including adjustable aperture control and the ability to adjust raw files, meaning those who are comfortable tweaking photos in Photoshop, Affinity, Pixelmator (or any other), can pull out the levels to make an image that looks they way they want, without any compression. It's a similar story for video. The built in Dlog-M profile means those with colour grading experience can make shots look extra fantastic. And with it shooting 4K footage at 30 frames-per-second, you're going to get detailed, crisp shots as standard. The end result in most conditions is great stills and great video. Sometimes in auto-mode, however, was the odd occasion where the camera struggled with contrasting light. Scenes where there was bright light in the sky, but the landscape beneath was mostly shadow, sometimes resulted in dark, grainy images (if HDR was switched off). On the whole we've been really impressed with the video and stills photo quality to come from this Hasselblad-equipped drone. It's been a predominantly issue-free experience. This drone really doesn't need much work to get it producing professional looking imagery. Still, DJI's app does take some getting used to, as we've mentioned more than once in the past. Changing shooting settings manually means digging into some fiddly menus littered with small text, which isn't something you really want to do on a mountain, in the cold breeze, while your drone is in the sky using up precious battery. There's a very good reason why DJI is the market leader of drones: its combination of high-tech features, flight modes and video/image quality is an unbeatable combination in the high-end consumer market. With the Mavic 2 Pro, that reputation is enhanced. However, the DJI drone line-up is starting to get a little convoluted given the number of models and overlap between them. It's hard to see where the Mavic Pro fits into the mix anymore. Those who want a super-portable drone will surely go with the fully-featured, but much smaller - and ultimately cheaper - Mavic Air, while those wanting a more powerful device that still fits in a backpack will undoubtedly be more inclined to cough up the cash for either the Mavic 2 Pro or the £1,100 Mavic 2 Zoom. If the Mavic 2 Pro's Hasselblad lures sound like the perfect match for you, though, then we wouldn't hesitate for a second in recommending this superb drone. If you're not convinced you want to spend upwards of £1,000 on a drone, or you're looking to buy your first one without losing out on features, the Mavic Air is a great option. It has a lot of the same Active Track and Quick Shot shooting modes as the Mavic 2 Zoom, a very similar remote control, and it's much smaller and easier to carry around. What's more, it costs almost half as much as the bigger drone.